Is your driving distance making it hard to play golf? Does your 7 Iron go the same distance as your 5 Iron? If you answered yes to either of these questions, then you need to increase your swing speed. In this third blog post of this series, Michael Gish (inventor of the Total Golf Trainer) explains how to increase club head speed. This content is sponsored, but we believe it can truly help you learn some import insights about the game, and speed. Most people know that one of the biggest factors for increasing distance is increased club head speed. There are many devices that calculate swing speed, providing necessary information for club fitters to properly fit equipment based on swing speed. The teaching professionals use this information to correctly help a golfer improve and playing professionals use this data to work on distance control with wedges and much more. The club speed of a Long Drive Competitor is up in the 150MPH, the average driver speed for PGA Tour players is 115-120 there are a select few players that will swing it in the 130’s but most dial back the speed for better accuracy. The average amateur golfer swings the club between 80-90 with better players around 100. The speed of your club directly affects the distance your golf ball will fly. 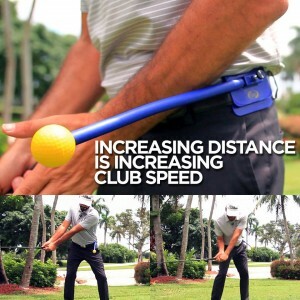 The question is how do you increase club speed? It starts with correct use of the ground and proper mechanics. The Amateur golfers have a tendency to swing too much with their arms and never learn the correct sequence of motion that produces “effortless power”. There are many other sports that require this same sequence of motion to generate speed. A baseball player throwing or hitting a ball, a tennis player creating racket speed and many others. All these sports create speed using correct sequence of motion starting with the lower body resulting in powerful balanced swing. The Total Golf Trainer Hip provides a trail setting that works on the correct sequence of the downswing, many better players and professionals fight the hips moving too fast or too early. The Total Golf Trainer Hip provides instant feedback for a correct sequence of motion. The number one amateur fault is not enough speed, rotation and balance out of the hips. The Total Golf Trainer Hip has a lead hip setting that provides visual and physical feedback on hip rotation and lower body movement. If you work on the lower body sequence and rotation you will increase your driving and iron distances. * There should be no contact to the training rod with correct hip rotation. To learn more visit the Total Golf Trainer website and use coupon code: THEGRINT25 to get 25% Off your first order. This entry was posted in TheRange Blog and tagged free golf handicap, golf, golf app, golf drills, golf game, golf handicap service, golf practice, golf trainer, total golf trainer. Bookmark the permalink.